Compression, the most basic type of molding, starts when the mold is removed from the press and opened. 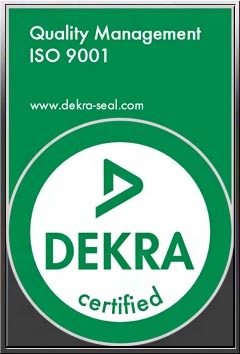 A pre-cut or shaped piece of uncured rubber of pre-determined weight is placed into the cavity.  The metal insert to which it is being bonded is also placed into the cavity at this time. The loaded mold is placed back into the press and the press is then closed. The pressure forces the plates together causing the uncured rubber to flow into the shape of the cavity in the mold. A slight excess of material flows out of the cavity along the gates and vents allowing the mold to close. The semi-positive design (the extension of the top plate into the cavity) is used with some parts that require a ram-like additional push on the material during the final closing of the plates. The mold remains closed until the rubber is cured, completing the cycle. 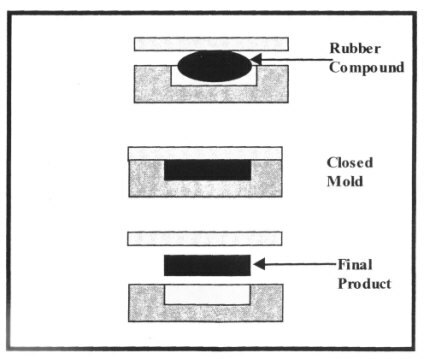 Compression molds do not consume additional rubber when filling the cavity like the “runner” of an injection mold or the “pot” of a transfer mold. While being conservative in the amount of rubber used to make the part, it requires a greater amount of effort to weigh and prepare each individual piece of rubber. Compression molds take longer to cure and each piece of rubber is hand-loaded into the cavity. Due to the simplicity of the mold, however, this is the most economical way to mold rubber parts.